Let’s keep it real: If the guy you’d been crushing on since childhood ghosted you and then zombie’d you (has anyone else noticed that the new dating slang has become increasingly dark and creepy?) just so he could cut beloved your wings off while you slept, you’d be a little cranky, too. Oh, and then he uses them to gain dominion over the kingdom and encroach upon your beloved forest?! Like, we’ve dated some real jerks in our time, but that guy takes the proverbial cake. But if there’s anything Maleficent knows how to do, it’s rule. Even when the chips are down and she’s lost everything, she manages to reinvent herself with a new leak - giving us black horn extravaganza and red lips for dayz - and get back out there to take back everything that belongs to her. Talk about a power queen! 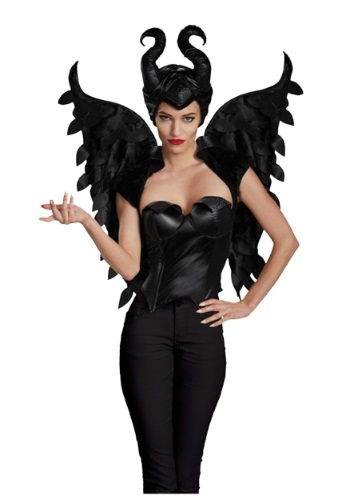 So do yourself right by taking a page from her boss book and complete your costume with these Maleficent Wings. Get that feathered realness and come through, dark fairy!